Beat eggs until foamy. Add sugar, syrup, butter, salt and vanilla; continue to beat until thoroughly blended. 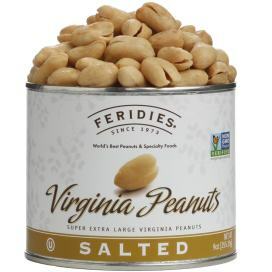 Stir in FERIDIES peanuts. Pour into unbaked pastry shell. Bake in a 375 degrees F oven for 50 to 55 minutes. Serve warm or cold. May be garnished with whipped cream or ice cream. Yields 6 servings.